September 11, 2017 By arzea 15 Comments This post may contain affiliate links. Read my disclosure policy. 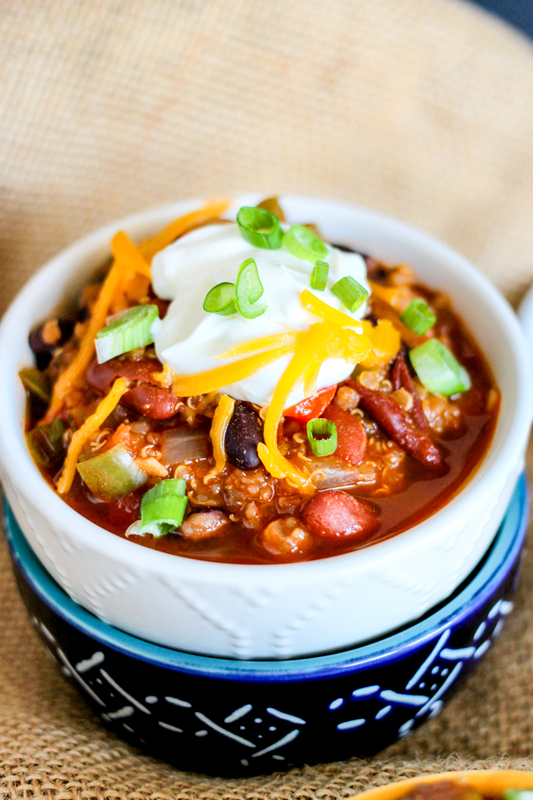 One Pot or Crock Pot Loaded Quinoa Chili is the perfect healthy vegetarian chili that will satisfy even the pickiest meat eater! I love chili, but being a vegetarian it’s hard to find a good chili that isn’t just all beans. I like beans, but I also like a little variety. I love this recipe because it is loaded with veggies and beans, and it’s so easy to make! You can either make this in the crock pot or make it on the stove pot! 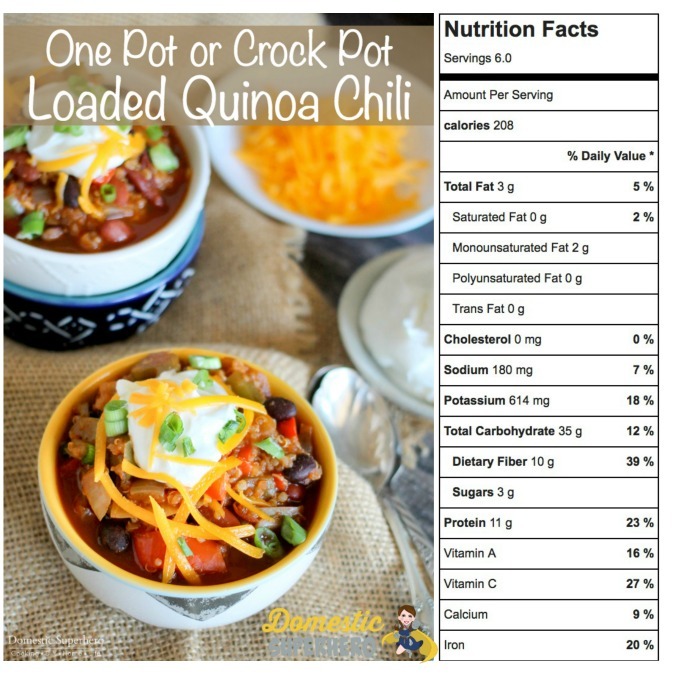 This One Pot or Crock Pot Loaded Quinoa Chili is a perfect healthy recipe (scroll down for nutritional info) for a cool fall or winter day! 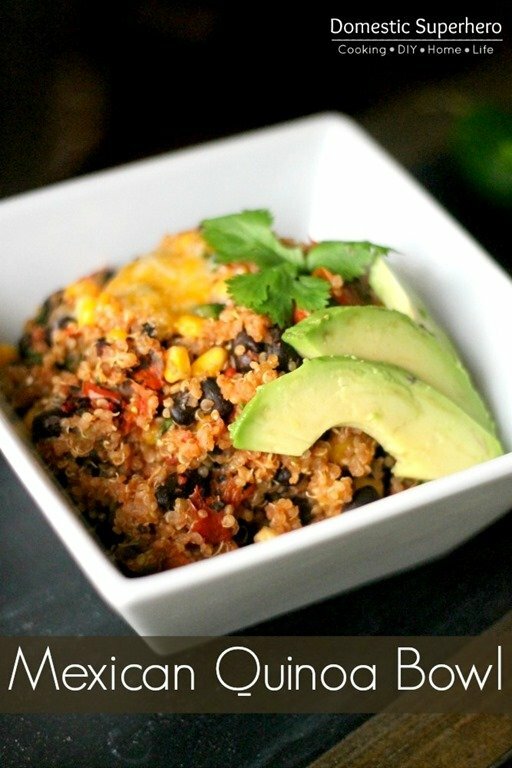 This loaded quinoa chili is really yummy! It’s hearty and satisfying, and I know plenty of meat eaters who also love it, and don’t even miss the meat. 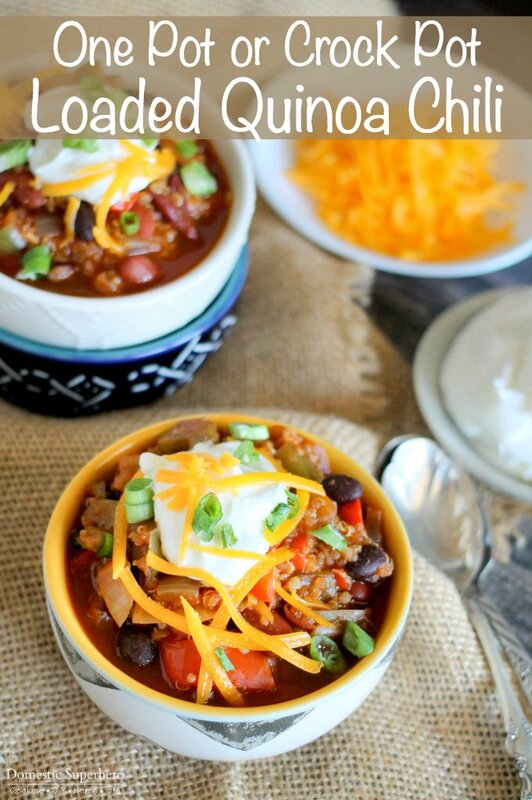 I love how healthy this chili is too; at only 208 calories per servings (not counting the garnishes), it’s really waist friendly! It’s perfect for cold winter days, and it would be perfect to bring to a football party or cookout! It’s up to you if you want to whip it up in 30 minutes on the stove top, or if you want to let it cook all day in the crock pot. I have made it both ways and it’s always delicious. While this loaded quinoa chili is vegetarian, you could also add meat if you want. 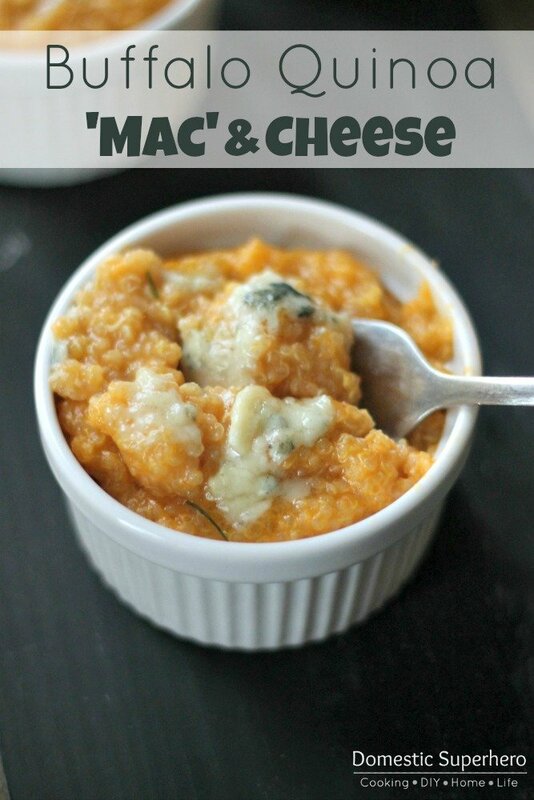 You can easily make this recipe vegan as well, just leave off the cheese and sour cream! Rinse the quinoa in a colander, set aside. In a soup pot, heat the oil on medium-high; add garlic, jalapeno, onion, and celery. Sauté until soft (about 3 minutes). Add green and red peppers and cook 5 more minutes. Add spices and herbs; sauté 2 minutes. Add the beans, water, tomato sauce/paste, and quinoa; bring to boil, cover, and simmer 20 minutes or until quinoa is cooked. Stir in soy sauce and pepper. 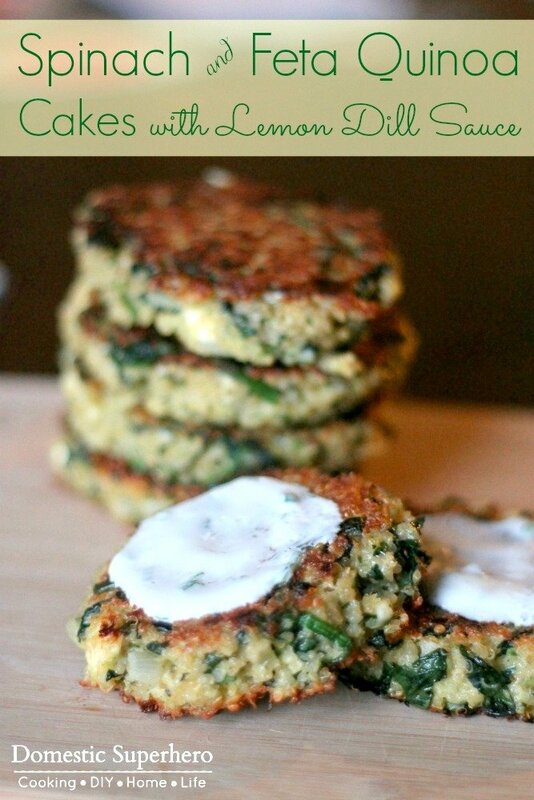 Serve garnished with cilantro, green onions, cheese, and greek yogurt if desired. In the crock pot add water, tomato sauce, salt, quinoa and beans. Add ingredients from above that were sautéed. Add soy sauce and pepper. I use kidney and black beans for this recipe, but you could really use any type you have on hand. You can add other veggies that you like as well; carrots, corn, more peppers, zucchini…it would all be good! I also usually freeze this, because it reheats really well. I have made the move from wordpress.com to wordpress.org and I’m sorry to say that my followers did not make the move with me. (something they don’t tell you!) I would like to ask you to come back and re-follow me via email or however you choose, if that’s ok. Sorry for the inconvenience! It’s still http://www.houseontheway.com. If you don’t get a confirmation email, you may need to do it again. Sorry. There was a glich with the email too! Looks delicious! What is the reason for the soy sauce – to add a bit of saltiness? It’s not something I’ve thought of adding to chili before. Looks absolutely wonderful, I love this! This is the perfect fall comforting dish! I’m loving this bowl of comfort food!! 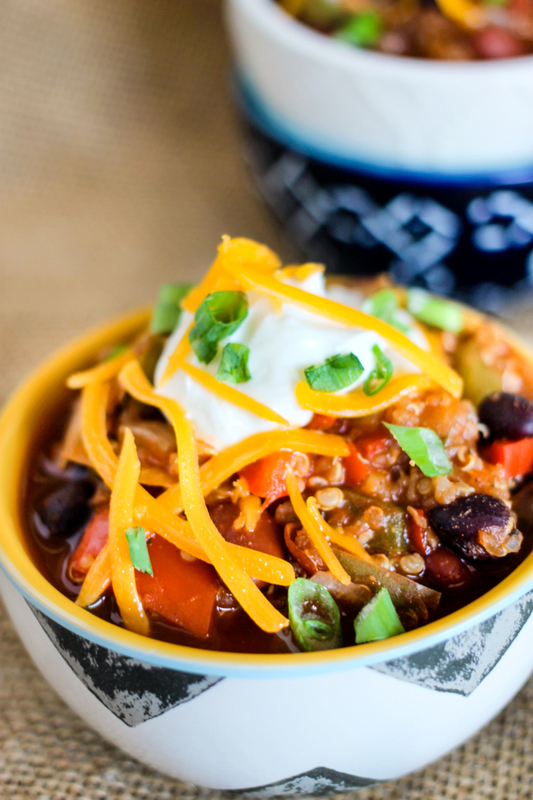 Love everything about this chili! What a perfect dinner to enjoy as the weather gets cooler! This would be perfect for Meatless Mondays. It looks amazing! What a delicious chili recipe! I love trying new chilis in the fall! 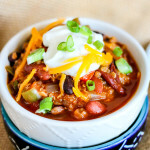 I’m always looking for new ways to make chili, adding this recipe to my menu! Great idea, this sounds delicious!